A&S Millworks of Tulsa, OK can create a unique look for your home or business cabinetry using many different tools and products. One thing that really ties a room together is built-in furniture. Freestanding furniture gives you more flexibility in decorating, but built-in pieces add much more luxury and classic style to a home. A&S Millworks can turn any idea you have into a beautiful piece of built-in furniture Tulsa home buyers will appreciate if you ever decide to sell your home. 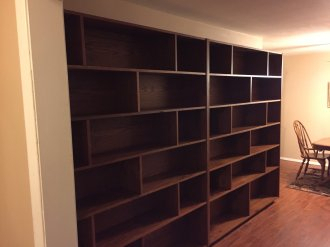 Remember, “If you can dream it, we can build it!” Even if you plan to stay in your home for the rest of your life, a built-in bookshelf or entertainment center can make your living space much more comfortable and enjoyable, not to mention beautiful. We’ll let you know upfront that you can probably buy a freestanding piece of furniture for less than you can have a built-in installed. However, there are so many advantages to built-ins that it’s easy to justify their higher cost compared to most freestanding pieces. The main benefit of built-in furniture is that it creates smooth transitions between rooms. The décor is more coherent, which will make the rooms look planned out and cohesive. It looks like it is part of the house instead of individual pieces that have been moved in. You aren’t limited to a built-in furniture option when building a new home or business. A&S Millworks can help you achieve this even if you have an older home. Our expert team of designers and builders will easily be able to tell you what’s possible with your existing structure. The fact that a built-in looks like a part of the wall gives your home or office a minimalist appearance. If you want a clean, airy design, a crisp white or a dark stained built-in furniture piece will do the trick. A&S Millworks can give you some tips about what will look best in any room of your home. Built-in furniture Tulsa residents install are quite versatile, despite what you might think. They blend in to your home and make it easier to redecorate because they can be painted or stained right along with the other walls, trim, or flooring. Another benefit of built-in furniture is that they save space. Because they are placed along existing walls in your home, they do not take up any more space than necessary, and you don’t have to account for moving them to vacuum or access outlets. A built-in piece will actually look smaller than a freestanding piece of furniture of the exact same size. You can get the same amount of storage or display from a built-in furniture area that takes up less floor space in your home. Built-in furniture Tulsa home and business owners want can also be accessorized with lighting and molding to give it a truly custom look. A&S Millworks will work alongside you to create a custom-made built-in furniture piece that is exactly what you need to pull your entire room – or several of them – together!